The automatic tube bending machine, also called tube bender tooling, is suitable to bend square tubes and round tubes. It can achieve to bend various wide range of bending radiuses. Because this machinery is equipped with fully automatic loading and unloading system, this tube bending machine from Changsheng Company cab run for long periods without supervision. Therefore, it can be widely used in many fields, such as automotive, furniture, healthcare, and other industries. If you have any questions, please contact us. We will give you immediate answer. This automatic tube bending machine can be used to bend round tube, square tube,so the skylights of arch roof forming machine can be produced. It is also used as the supporter of the first arch sheet of arch roof forming machine. Other dimension is also available. Yingkou Changsheng Steel Structure Project Co.Ltd is a professional manufacturer and supplier of automatic tube bending machine in China. 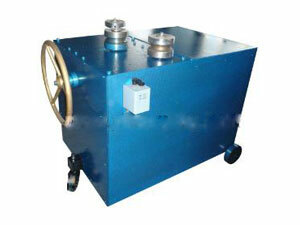 Apart from auxiliary equipment products, like multifunction window - door taping machine, color coated steel coils, etc. we also offer EPS - rock wool sandwich panel machine like C purlin roll forming machine, Z purlin roll forming machine etc; high pressure polyurethane insulation painting machine including low pressure polyurethane foam machine and high pressure polyurethane foam machine; k-span machine, like automatic building machine, ultimate building machine and arch style buildings forming machine. With good quality and affordable price, the products produced by our company has exported Germany, Holland, India, Indonesia, New Zealand, Syria, United Arab Emirates, Russia, Kuwait, South Africa, and Bangladesh. If you are interested in our products, please contact us for details.